There are also continuation courses for actors, on different subjects and of varying length. Students are selected by means of special auditions. One requirement for taking part in these auditions is a good command of the Swedish language. The Academy has no scholarships to offer. Every year the Academy accepts 8-10 students to the Acting Programme. The number of applicants is usually about 900. To the Mime Acting Programme, with auditions every third year, the number of applicants is usually about 150. The next audition to hte Mime Acting Programme will be in 2009. The training of actors in Sweden started in 1787, initiated by King Gustav III. Until the mid-60’s the education of actors was closely connected with some of the theatres in Sweden; in Stockholm the Royal Dramatic Theatre. In 1964 three separate acting academies were established. 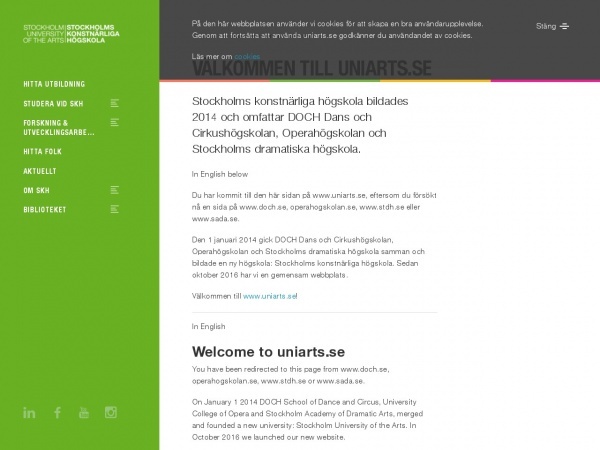 In Gothenburg and Malmö as parts of the Gothenburg and Lund Universities respectively , but in Stockholm as an independent academy. In 1996 a fourth acting academy was established in Luleå, in the north of Sweden.